That was a recent status update on my Facebook page after—you guessed it—a certain poisonous arachnid decided to snack on me. While that post was morbidly humorous, the effect of the spider bite was serious. The thing to note is that I’m a First Aid/CPR/AED Instructor. For twenty years, I’ve taught people how to respond to emergencies like mine, so I acted quickly. And still, I required one round of steroids and three rounds of progressively stronger antibiotics to combat the poison. 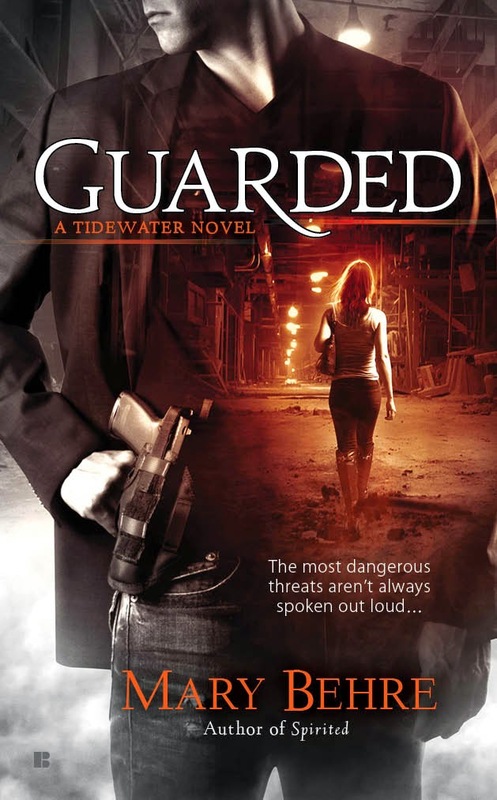 As I sat in the doctor’s office the morning after the bite, waiting to be seen, I found myself wishing I’d had the capabilities of veterinarian Shelley Morgan, the heroine of my latest novel, Guarded (A Tidewater Novel #2). She’s is an animal empath. Shelley can communicate with virtually any living creature she meets. If I had had her crift (cursed gift), I could have simply explained to the spider that setting up residence under my mailbox was a bad idea. Then he could have packed up his web and moved to more a suitable location. You know, like the woods; far, far away from me. Here’s a quick blurb about Guarded. Will he be able to help her clear her name before he's forced to arrest her? Want to know more? Read on for an excerpt. “Something’s wrong with Mr. Fuzzbutt.” Beau’s angelic voice rang out seconds before the backside of his long-haired black guinea pig bounced before Dr. Shelley Morgan’s eyes. “Doc, can you help him?” Beau’s voice, still high-pitched from youth, wobbled as he spoke. She turned to the worried ten-year-old who was small for his age. His large luminous brown eyes were framed by thick black glasses. His clothes, although threadbare and clearly hand-me-downs, were clean as were his faded blue sneakers. Not that the little guy would be able to do much. The last time the clinic received donations, the dog food had come in fifty-pound bags. Beau likely didn’t weigh more than sixty-five pounds himself. Plus, it had rained late last night and the town handyman she’d hired hadn’t had a chance to fix the hole in the shed’s roof. So chances were good several of the bags were sodden and useless. Then Beau was out the front door. The length of bells hanging from the handle jangled and banged against the glass as he took off around the corner to the storage shed. The eye contact formed an instant telepathic connection. Shelley’s world swirled to gray. Still vaguely aware of her surroundings, she focused her attention inward on the movielike scenes sent from the little boar in her hands. An image of Beau’s anxious face peering between the bars of the cage, filling and refilling the bowl with pellets sprang into her mind. At first she thought the guinea pig was repeating the same image over and over, but quickly she realized what was happening. The little pig winged an image of Beau snuggling him close and occasionally kissing him on the head as they watched Scooby-Doo. Mary Behre, author of the Tidewater series, is the lone female in a house full of males and the undisputed queen of her domain. She even has the glittery tiara to prove it. She loves stories with humor, ghosts, mysteries, and above all else, a good romance. When not writing, she enjoys reading, gluten-free baking, and hanging out at the beach with the most important men in her life, her family. If I could speak to animals I would want to know why my cats seem to randomly change their minds about which canned cat food they like. Usually this change occurs after their favorite flavor has been bought in large quantities. Sorry about your spider bite, that is awful. I see this is the 2nd book - is it best to read the first book first or do they stand alone?? I love the idea of being able to talk to animals... it would be great to know what is wrong at times or what they were thinking or feeling! My father was bit by a spider once... it took forever to heal even with meds and it still left a mark on his leg. Hope you are feeling better! I think I would just like to communicate with my animals so I would know when something is wrong. And I hope you recover quickly...I just hate spiders! Thanks for the chance at the giveaway. This sounds like such an interesting premise, i look forward to reading it! This book sounds so intriguing! A vet who can talk to animals?! I am already in love with that blurb and haven't even met the hunk yet...definitely going to read this book! And if I could talk to animals I would want to solve problems for them, especially related to human activities. I'd like to know what my dog thinks and if I'm "babying" him too much :) Congrats to Mary on the new release and wishing her a fast recovery! I also have a "no mercy" policy for spiders in my home. They have benefits *outside* but not inside. Thanks for sharing! I'd want to know what they think about how we are treating the planet. I'd love to know why my cat doesn't like the front threshold. He glares at it and will only come in if I shake his food. I want to know what do they do when we are asleep or do they really understand us and speak human when we are not around. If I could talk to animals I would want to know their being treyed well and if their sick. I'd want to know if they feel cheated that their lives are consist of little more than trying to find enough food to survive, and trying to survive becoming others' food? The book sounds great, If I could talk to animals, I would want to know how they feel and what they are thinking. I have 4 cats and 3 dogs, and I am always wondering if they could talk what would they tell me.